Incursed sounds Scandinavian. Very, very Scandinavian. Great was my surprise when I discovered that this band was from Spain. Even greater was the surprise when I concluded that this was a pretty nice record as well! Strong symphonic folk-metal is what these guys deliver, and the influences from Ensiferum is clearly noticeable. These guys have been listening closely to their Scandinavian brothers anyway. The result is a powerful, epic but at the same time catchy form of folk-metal. The vocals are mainly grunt, but are sometimes interchanged with clean vocals. The music itself sounds as typical keyboard-orientated folk-metal, with enough space for the guitars to make it into an interesting whole. 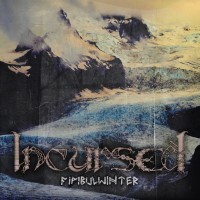 A descent record from these Spanish lads from Incursed. However, they tend to miss their own sound. You can clearly hear that they draw their inspiration from the bands north of Europe, but these sources of inspiration doesn’t seem to be the same at each song. This results in a CD that doesn’t sounds like a whole, but more like 11 separate songs. If the band could create an own, unique sound, I predict that this band could become really popular one day!